The design of your website and how the navigation is laid out will keep prospective clients reading your information which is a big part of building trust. Having a site that is pleasing to the eye, easy to read and easy to follow goes a long way in getting clients. If your site is unorganized with hard to find basic contact information, people will just click on to the next site. Google also likes websites that load quickly and are easy to use! Use text that is big enough and easy to read. Use plain black text. Visitors who can’t read the text will leave your site. Period. Use a white or light colored background. Use subheadings to break up paragraphs and emphasize information. In the search engine box, upload the photo in question and click search. Use soft colors that suggest relaxation if your business is relaxation focused. Increase line spacing where possible, leaving more space between lines. If you use links, state what the link is – especially if it is a PDF file. Put your contact information – phone number, address, and email address on the top or side of EVERY page. Make it easy for people to contact you. Don’t use Flash Intros or Flash of any kind. Flash is dead. Search engines can’t find it, and people don’t have time to watch it. Avoid pop up or pop under pages! NO MUSIC! Sorry but it is true. The music is more about YOU not your prospective client. If I want music when I am online, I will play what I want and when I want it. If a site starts playing music, I will immediately close the window and others will too! Red on black doesn’t look cool nor does any other color text on a black background. The navigation tabs or buttons will have text links in them that connect all your pages together. Remember, search engines love links and will find you through a link! They will follow the links within your site to index the whole website. The way you link your site together is an important part of search engine optimization. This is probably THE most important concept that I hope you will understand! 1 and the linked pages on your navigation bar then become Tier 2 pages. Your Tier 2 pages will link to Tier 3 pages. 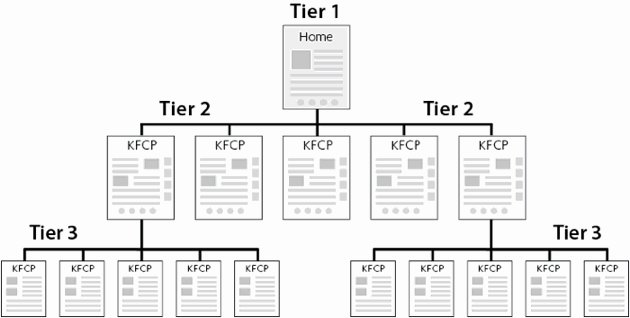 You don’t want to have more then 3 tiers because Google usually doesn’t index those pages. Keep it simple and straight forward! Have a navigation bar down one side of the page and/or one at the top of the page. supposedly now read the words next to the link. The real idea is to create natural looking links. Make your linking as natural as possible and as clear as possible. The Tier 2 pages will have links in the body of the page to the Tier 3 page and/or will contain a navigation bar with text links (or buttons or bars) and will influence the reader to click on the links. called ‘breadcrumbs’ to your pages. Breadcrumbs is a navigation system that tells users where they are on the website so that they can easily navigate back to the home page or to the page that they just came from. Some website builder systems will do that automatically for you. WordPress has plugins to allow you to do that. Clear and easy navigation is an important part of building traffic and giving your reader enough information so that they will make the call for the appointment. That is also why it is important to have your contact information on each page. Each page should also have text suggesting that they make a call or contact you by email. Using Photos on your massage business website. Another part of good design and SEO is having photos on your website. Photos are becoming a big part of making a site interesting and compelling for readers. People relate to photos that mean something. A well designed theme or template will also integrate photos into the pages to complement the content. One of the issues with photos is finding photos that actually represent what we do as massage therapists. You can’t just go searching for photos on Google Images and use whatever images you find. That could be a big copyright issue. Most everything online is the property of the owner. If you find a photo that you would like to use, you need to get the owner’s permission. The thing is that many people have ‘borrowed’ photos from other sites and think that they are their own. You don’t really know the true source of a photo unless you find the photo specifically on the website of a photographer. Google still likes original photos best! Although website design is important navigation and search engine optimization (SEO) is where the money is. The nicest looking site that is not optimized won’t really matter because no one will see it. A website with a simple design that is pleasing to the eye and is organized and optimized is what will attract customers to you. So… design is one important aspect of SEO. The next step is to tell Google and search engines what you have on your website and that your website exists!